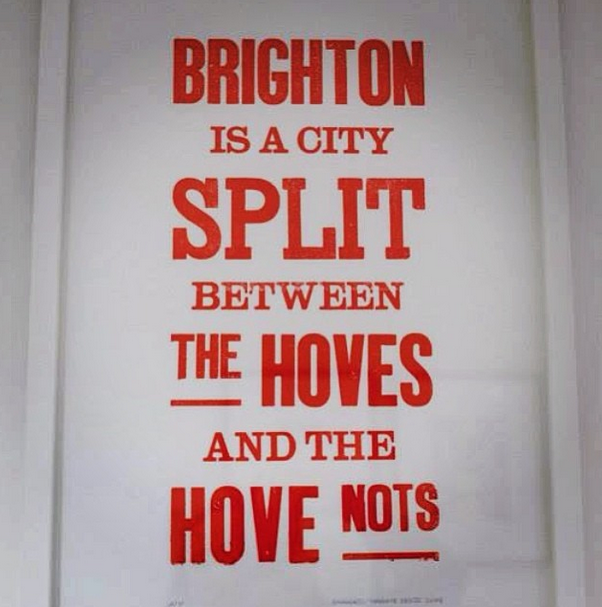 I came across a tongue-in-cheek print* this week declaring that "Brighton is a city split between the Hoves and the Hove nots". I think I fall pretty much into the latter category. Anything past Palmiera Square and I'm packing a passport and unplugging the toaster. But there has been a growing list of Hove cafes, bakeries and restaurants, some shiny new and some ticking along with consistently good feedback that have been tempting me out of my BN1 and BN2 comfort zone. And I adore French food. 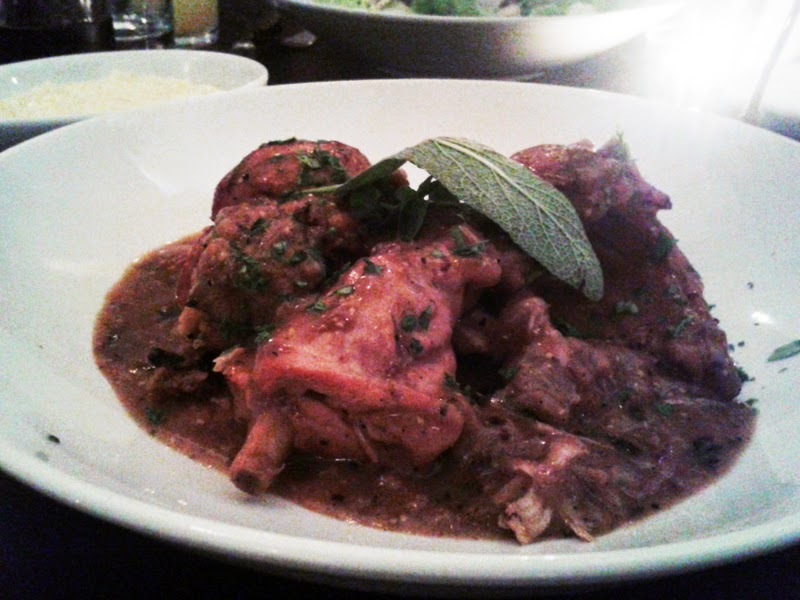 I think after Italian, French is what I most crave when dining out, the decadence and richness of it. Pascal Benamari is a chef who's has been behind a few local favourites with his latest restaurant, Le Nantais Bistro, taking over a nice little space that used to be the very popular Harry's. The interior is a contemporary, sophisticated soft grey affair, something that would suit both a romantic dinner for two or with friends. They have made it stylish but not over the top. Normally I'm straight in with the specials board but unusually nothing appealed. Not sure if lasagne or mozzarella have any place in a French restaurant and as for anything wrapped in Parma ham, I parked that in the early 00s. The a la carte though is bursting with French classics and modern tweaks. Quenelle are something I fell in love with after a trip to Lyon and these light, airy langoustine quenelle were the best I've had to date. They can suffer with being too dense, almost like a dumpling, but these were anything but. The rich crustacea bisque sauce was exactly what I look for in French cooking; rich, luxurious and silky. I've been thinking about this sauce a lot since I ate it, having such amazing depth of flavour. 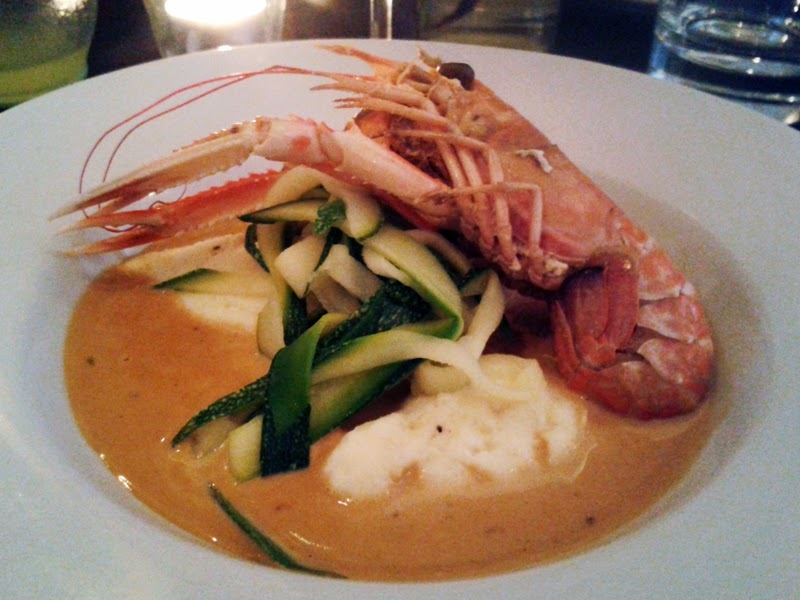 Freshened with ribbons of courgette tagliatelle and a plump langoustine, it really was a perfect dish. I was dining with my blogger friend Rosie and luckily she can really put her food away (and she's tiny - grrrr!). 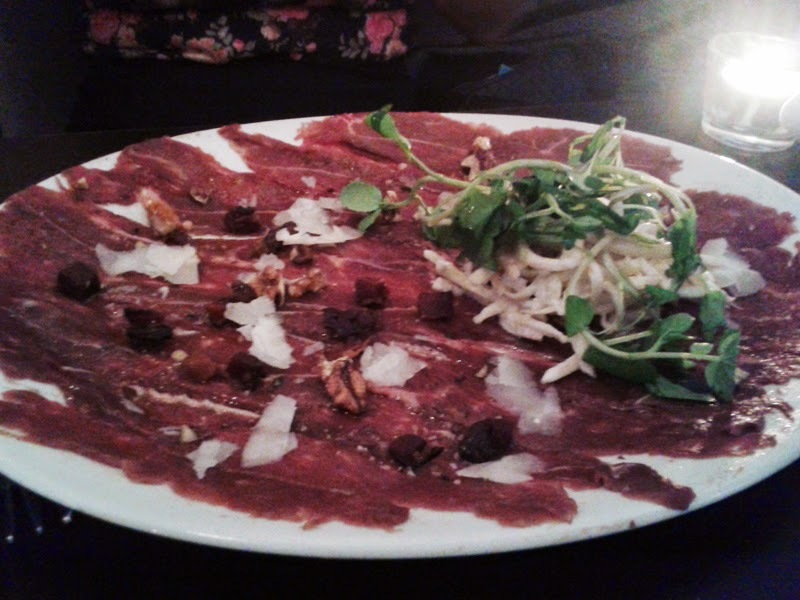 The duck carpaccio was an extremely generous portion. Normally you would expect a few slices, even this thinly cut, but the plate was quite something. The classic celeriac and apple remoulade was the perfect accompaniment, a fresh and crunchy contrast to the earthy duck. For main I ordered the rabbit, something I cook when I can get hold of it, which is not very often, so always feels like a treat. You have to work hard for your dinner when eating rabbit, picking though intricate bones and the meat is typically conservative, but this was a good portion and not in the least bit dry. Again in a sauce, a deep mustard, this was a more rustic dish but done so well it felt like it had been given a waistcoat and smartened up for the evening. Served simply with a fine pomme puree, it was another hit. 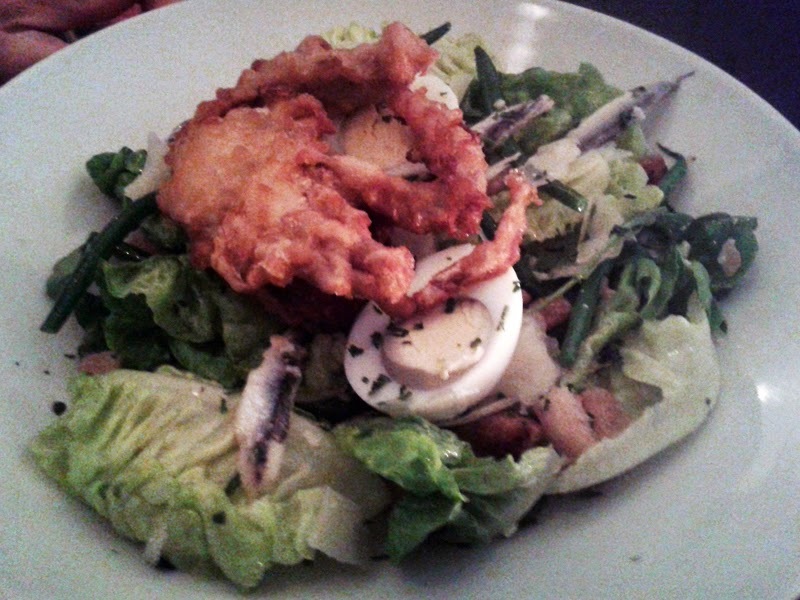 The only dish that slightly disappointed was Rosie's soft shell crab Caesar Salad. The eggs were greying and croutons seemed a little greasy but the crab batter was fine and anchovies fresh. They had also forgotten to dress it which was rectified quickly. It was ok, just compared to the other dishes, probably could have been elevated to be a little more special. The table next to us, reassuringly a group of French youngsters (I can say that now I'm OLD), ordered an eye-popping sharing plate of Cote de Boeuf. Luckily our forks had been taken away as I'm sure they would have found themselves missing a piece or two. I will most definitely be returning for that. Quite possibly on my own! The only way to finish was the Assiette of desserts of course, perfect for the indecisive and greedy, of which I am both. There was a nice syrupy crepe Suzette, a ball of nougat glace, a piece of chocolate and raspberry delice, apple tart and a brulee. 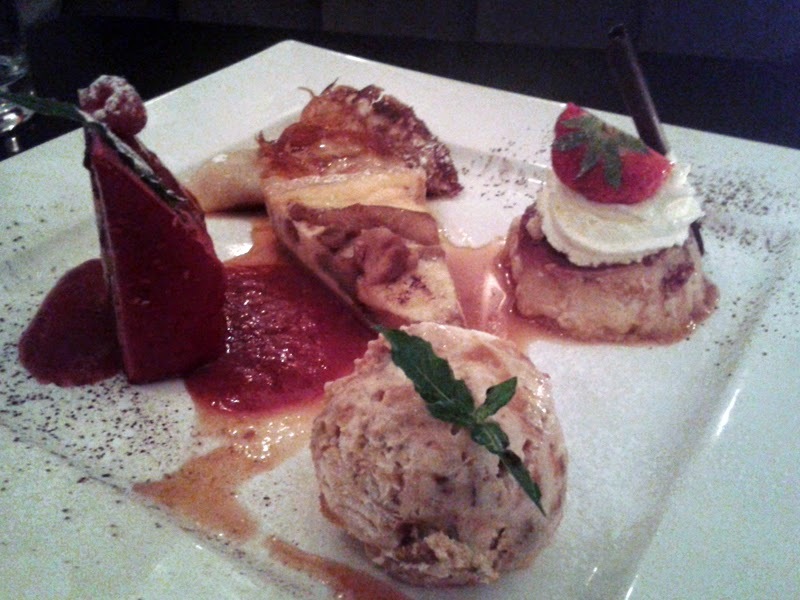 All nice enough and a good opportunity to sample a cross section of practically the whole dessert menu. Service was friendly if a little sketchy in places, things like forgetting cutlery, cutlery placed upside down on the table and missing dressing, all minor really. I like that the waiter refused to take our dessert plate away unless the last mouthful, which inevitably remains when sharing, had been polished off. There's always a place for a bit of charming French cheekiness in my book. Le Nantais Bistro is a great neighbourhood restaurant. Smart, good quality and really reasonably priced. A place people will return to again and again because of it. (Our bill without alcohol was just £30 per person which I though was good, honest value.) They are even open from breakfast and have a good looking lunch menu too.